Oil on canvas, 70 x 116 cm. Christ collapses under the weight of the cross on the Via Dolorosa (“Way of Grief”). Sympathising, the young St. Veronica wipes the sweat from his brow with a bit of cloth (the Veil of Veronica), while Simon of Cyrene begins to take Jesus’ cross so he can carry it for him. The execution square Golgotha (also known as Calvary) can be seen atop the hill beyond the group, while the city of Jerusalem is also visible in the background. In order to create depth in the composition, the artist has utilised the so-called aerial perspective, where the colours in the foreground are dominated by a warm colour palette while the shades take on gradually cooler and paler colours as the distance between an object and the viewer increases. With his luminous halo and central placement in the composition, Christ appears as the focal point of the subject. 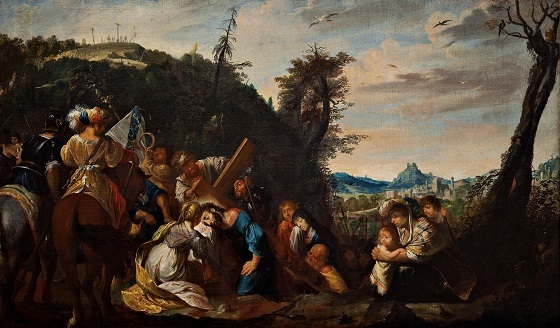 The main subject is further highlighted by the other characters in this scene, all of whom are facing Christ.